Balla Golf Club Winter League top scorers in the ladies' and gents' sections pictured at the presentation of prizes in The Olde Woods Balla. 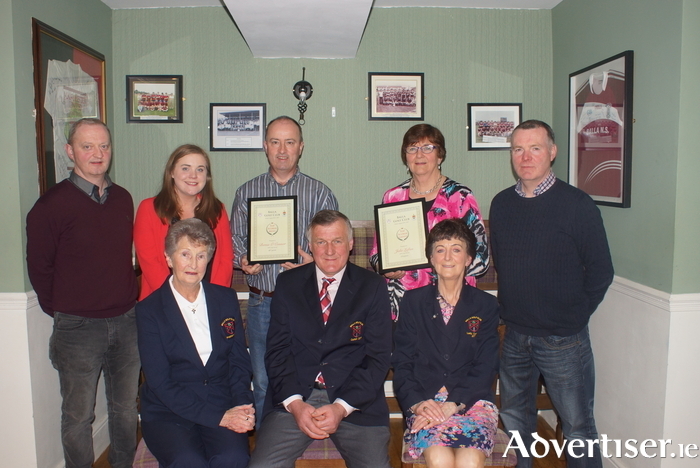 Back row: John Dempsey (The Olde Woods), Laura Cuffe (AIB - sponsor), Bernie O'Connor (top gents' scorer), Julie Loftus (top ladies' Scorer), Paul Cuffe (sponsor). Front row: Nancy Golding (president Balla Golf Club), Sean Canny (captain Balla Golf Club), Mary B Prendergast (lady captain Balla Golf Club). There was plenty of good scoring in the clubs around Mayo last weekend as the sun shone around the county. The winners of last weekend's Captain's Drive In scramble was the trio of PJ Brett, Jim Rodgers, and James Waldron who scored 43pts for their round, they edged out the team of Aodan MacSuibhne, Willie McNamee, and Brigid McNamee into second place thanks to their back nine play after the second placed team also finished on 43pts. Third place went to the trio of Bert Eagleton, John Nally, and Paul Cuffe who finished a point further back. The club's Wednesday evening scrambles will commence next Wednesday, April 5. Members are reminded that the membership subscription for 2017 is now due. Tony O'Toole was the winner of the gents' competition last weekend with a score of 39pts, he finished two points in front of Pat McDonald in second spot on the leader board. The Gross prize went to John C Burke, with the Cat 1 win going to Justin Keady, the Cat 2 to Oliver Walsh, and the Cat 3 to James Dooley. The front nine prize was won by Declan Flaherty with a score of 22pts and the back nine prize was secured by Vincent Larkin who also scored 22pts. The ladies' competition was won by Anne Tracey who scored 34pts, she had just one point to spare over Emer Ferrick in second place. Third spot was taken by Joanne Comer with Carmel Sweeney finishing in fourth spot. The front nine was won by Darine O'Leary who shot 16pts for her first half of her round, with Helen Healy winning the back nine with 17pts. Kay Buckley was the winner of the ladies' competition in Ballyhaunis last weekend, she finished in front of Margaret Dyer in second place with Josie Folliard coming home in third place. The gents' competition was won by Tony Grennan with John Freeman in second spot and third place going to Tom McGuire. The club had a gents' 16 hole competition last weekend which was won by Stephen Munnelly with a score of 38pts, he finished just one point in front of second placed Pat Ryan. Billy Evans finished in third place also with a score of 37pts, but was just edged out into third place by Ryan's back nine scoring. The ladies' 15 hole competition was won by Veina Brett with a score of 34pts for her round, Regina Kerr finished in second place just one point behind the winner. Third place went to Anne O'Sullivan with Margaret Naughton finishing in fourth spot. The gents' competition in Claremorris was won by Fergal Hughes with a score of 41pts, the Cat 1 win went to Pat Coyne on 34pts, with Kevin Heneghan taking the Cat 2 victory with a score of 38pts, and JP Hughes and Mark O'Brien taking the Cat 3 and Cat 4 wins respectively. The ladies' competition was won by Carmel Kilgallon who scored 31pts, with Florrie Campbell taking the ladies' nine hole competition win with a score of 19pts. The club will be holding their first AM AM of the season, running from this Monday to Sunday, April 9. The cost of entry is €80 per team of four and €60 for re-entry. For booking call (094 ) 9371527. Last weekend's open competition was won by John Eastman with a score of 41pts, second place went to Tim Crowley on 36pts, and Eamon Mongan finished in third place also on 36pts. The ladies' competition was won by Margaret Sweeney with a score of 19pts, she just held off the challenge of second place finisher Carmel Timoney on count back.